We, for one, applaud his guts. And his toes. Look, they even come in Nats colors! We're not ones to talk about fashion. Oh wait, yes we are! Like here, here, here, here -- oh, and here. OK, fine, we are ones to talk about fashion. Although we refuse to discuss the Great Ugg Incident of 2006. Some things just need to be left behind. 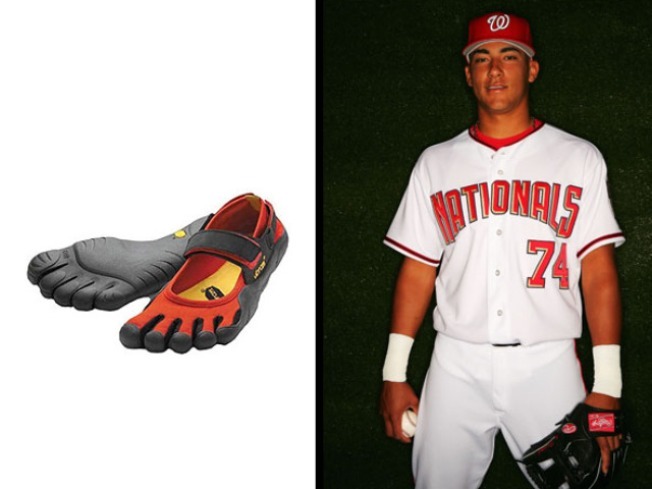 But we do feel the need to discuss the fact that Nats shortshop Ian Desmond -- who made his debut in the big leagues last Friday -- has been getting some flack for wearing a pair of Vibram Five Fingers around the clubhouse. He tried to explain, first, their technical purpose. With the popularity of au naturel running books like this one, barefooted running/exercise -- or a close approximation of it -- has become, if not a phenomenon, then at least a niche large enough for mainstream attention. Even Nike has its own "free running" creation. You can tell a lot about a rookie by how he manages a good ribbing. Desmond was unflappable. He told Olsen, first, that the shoes help him strengthen the muscles around his feet. We're not sure why the Post keeps using "first" in this entry when there never seems to be a "second," but maybe it's because they weren't wearing Vibram Five Fingers and didn't have their toes to count on. Surely that's it! We WANT to mock these shoes. Really, we do. They're pretty much neon pool shoes with individual pockets for each toe. But there's just something so individualistically brave about waddling around, all amphibian-like, even when you're in the middle of a stadium in Southeast D.C. In such a serious, button-downed kinda city, we need some source of weirdness. Desmond and his frog shoes are filling a void that lawyers and politicians could never even hope to fill. Meanwhile, City Sports looooves putting these little guys on discount, so if you need a pair of your own (and you're impervious to teasing), we suggest you try there.